Piemonte – the land where Nebbiolo not only grows best, but the alchemy of grapes to wine would delight Bacchus himself. One of the region’s rising alchemists is 31 year-old Elisa Scavino. Her family name should be familiar to any Barolo-phile since she is the granddaughter of Paolo Scavino, founder of the venerable Castiglione Falletto winery bearing his name. Although famous for its 7 Baroli produced from grapes of 19 single crus in 6 of the 11 Barolo appellation villages, Paolo Scavino’s portfolio also includes other lovely wines of distinction. What I love most about Piemonte – what’s missing from Tuscany, in my opinion – is the broad range of different interesting varietals, both red and white, the Langhe and Roero offer. That’s certainly not missing at Scavino. Six other wines grace the winery’s portfolio, all beautiful expressions of the region’s varietals. 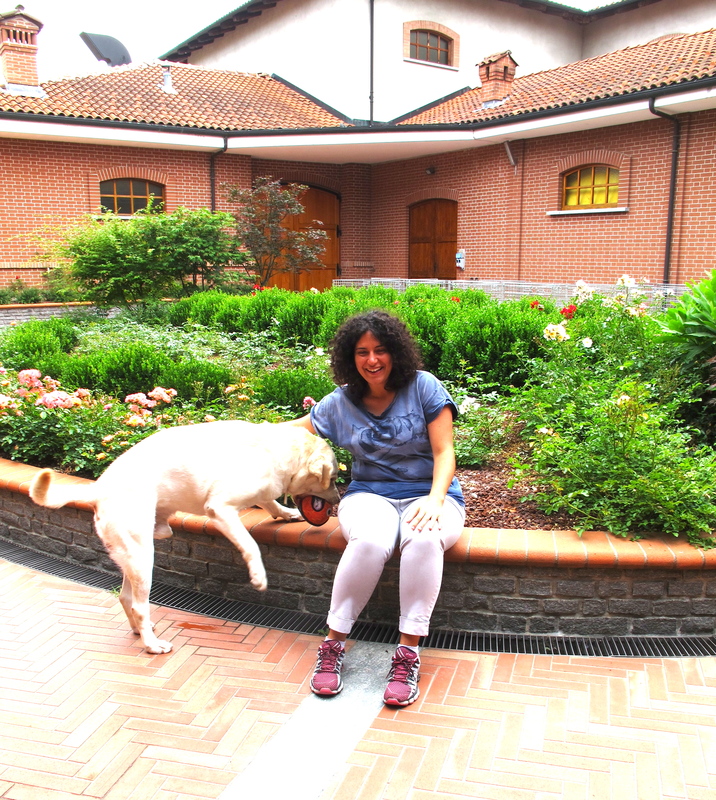 This month I visited Piemonte to continue research for my book, “Under Discovered: Le Donne di Piemonte.” One of the women of Piemonte who will grace my book’s pages, Paola Grasso of Ca’ del Baio, introduced me to Elisa. Since I restrict my writing to family owned wineries where the “family business speaks to the culture of wine,” in Paola’s words, I delighted in the opportunity to meet someone from the famous Scavino family. On my last full day in Piemonte, I drove to the Scavino winery, spitting distance from our agriturismo, Gioco dell’Oca, on the outskirts of Barolo. The winery’s buildings reflect its owners: non-pretentious, but distinctive. Setback from the busy Barolo – Alba highway, the winery lies behind a lovely iron gate with a simple “S” on each panel. Other than the obscure sign I barely saw from the highway, it was the only clue I was in the right spot. The familiar tinkling sound of bottles moving along a bottling machine’s conveyor belt greeted me when I walked through the massive wooden doors into the courtyard. It seems like everywhere I went, something delicious was going into bottles, some for sale now, some to age for a few more years. 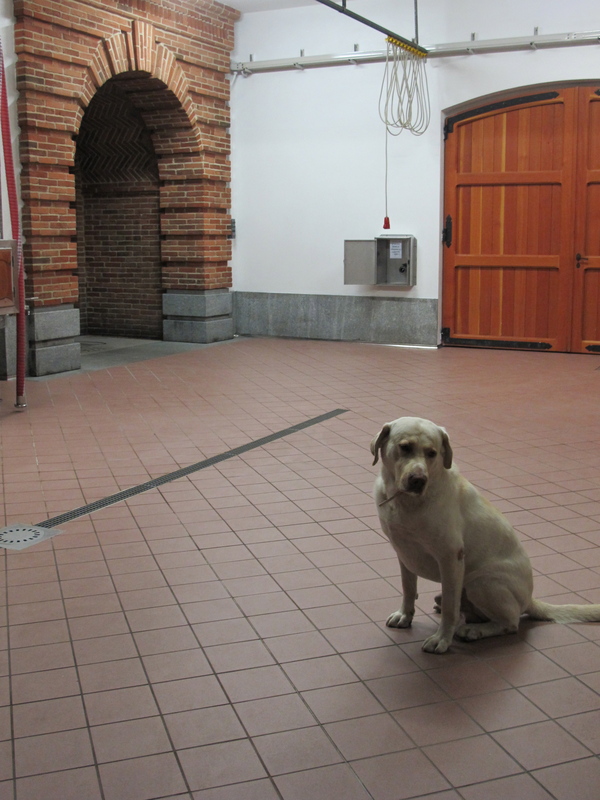 After a few short minutes alone in the tasting room, the door opened. In trotted a large, somewhat smiling yellow lab, Lino (short for Ercolino), and Elisa Scavino. The first thing I noticed about Elisa was her smile. Unlike many people whose smiles are restricted to the muscles around their mouths, Elisa’s smile sparkled in her dark, half-moon eyes as well. My intuition is usually spot-on. It was screaming, “This is going to be a wonderful experience.” It certainly was. Elisa has plenty to smile about. Like Paola Grasso, Elisa was born in a time when women are no longer relegated to the shadows. “Women’s work” no longer excludes making wine. Elisa is a member of a growing demographic of talented, rising stars of Piemonte: young women. Since the 1980s, Piemontese women now possess career choices. However, for Elisa, there was no “choice” to make, only opportunity to grasp. She was born into a wine producing family. To her, like Grasso, there was never any doubt she would be a winemaker. Since early in her life, Elisa worked hard to join her father Enrico’s profession. To her, to be a successful winemaker is to honor her father. It’s a good thing women are now accepted in the wine industry since so many of the prominent Piemonte houses will pass into women’s hands in coming decades. This was not always possible. For generations, the birth of daughters and no sons doomed estates. Given the culture of the times, having girls was akin to being dealt a “due di picchi” (bad hand) at cards. Those times have changed. In the 1980s, women like Chiara Boschis and Livia Fontana graduated from the “school of hard knocks” after learning viticulture and oenology from their fathers. These pioneering women emerged as Barolo’s first women wine producers. When Barolo master, Bartolo Mascarello, passed away in 2005, daughter Maria Teresa assumed control of the family winery, continuing in her father’s footsteps. Now, Elisa and sister Enrica, Marta Rinaldi, the three Grasso sisters – Paola, Valentina and Federica – and many other women are in line to inherit generations old wineries. The future of great estates is no longer at risk to the whims of genetics. Although daughters of wine families could learn winemaking from the time they first walked, formal wine industry training was not possible. Only in recent decades did the famous Wine School of Alba (formerly the Royal Enological School) Domizio Cavazza founded in the late 19th century accept women students. Elisa and two other women, including Rosanna Gaja, comprised one of the earliest classes of women oenologists the famous school graduated. For Elisa, however, the only education she wanted was the one she got in the vineyards and cellar with her father. Her parents encouraged her to consider other studies, such as science or classical studies, but only wine school’s six-year program would do for Elisa. Next, Elisa graduated with an oenology degree from the University of Torino’s three-year program. Since long before her first awareness of Barolo’s special nature with the release of 1985 vintage in 1989, Elisa knew what she wanted to do in life. She now had the tools to do it. 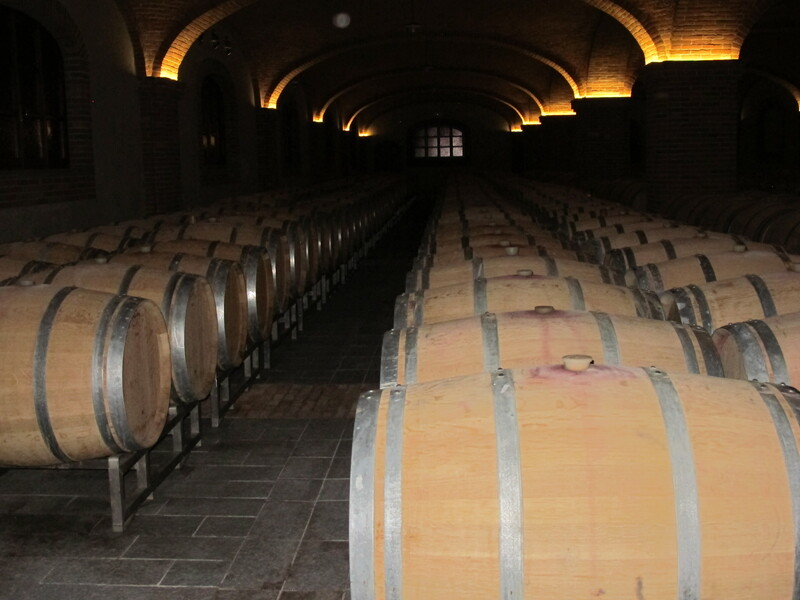 In January 2005, Elisa returned to Castiglione Falletto and took up her position in the family business. Shortly after graduating, with older sister Enrica, Elisa made her first marketing trip to America. Enrica, who studied languages and now handles marketing and sales for the winery, wanted Elisa to experience firsthand the their wines’ American market. It was an eye opening experience. Following the birth of Enrica’s first child in 2011, Elisa assumed more responsibility for traveling the world to show the wines. Aging wines to their perfection takes time and money. Elisa enjoys tasting their wines with clients in different countries, but home definitely is where her heart lies. Although Elisa cherishes her earliest childhood memories of her father playing the harmonica while he drained casks in the cellar, she loves her work in the vineyards most of all. She explained to me how liberating she finds the lack of control one has when growing grapes. Elisa finds “playing and interacting with nature” and following “nature’s philosophy” less intimidating than working in the cellar where she must confront the alchemy of the wine. Control is crucial in the cellar. I envy Elisa’s ability to eschew control and let nature take its course. It’s a gift. 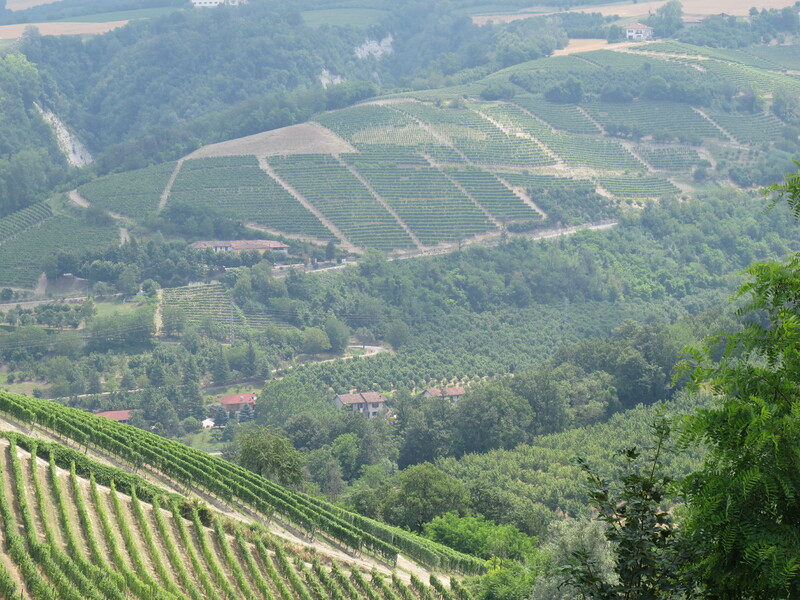 The vineyards of the Barolo appellation stretch for miles across the Langhe’s rolling hills. 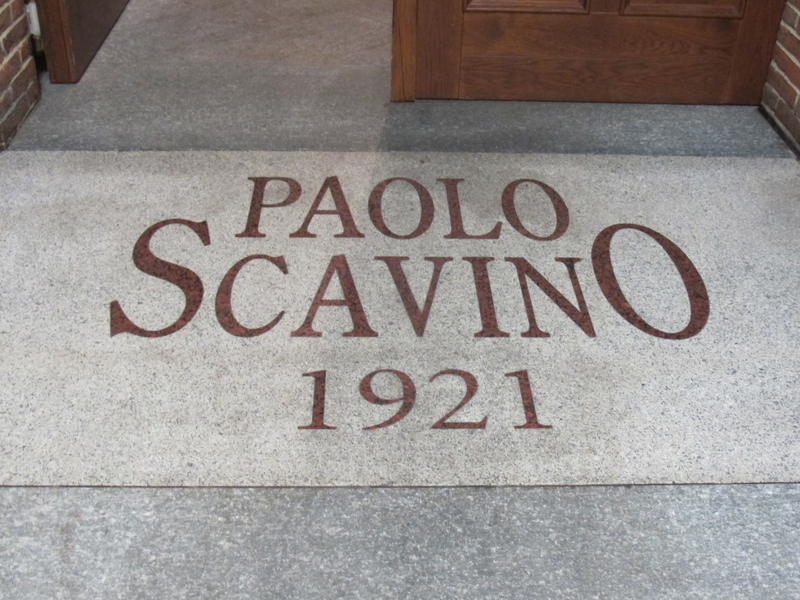 No doubt, Paolo Scavino would be proud to see his granddaughters, members of an evolving generation, walking the path he laid for them when he started his winery in 1921. No more shadows for the women of Piemonte.